All time pageview: It's over 9,000!!! Neisseria are usually arranged in pairs, non motile, facultative anaerobes that are gram negative. They are catalase and oxidase positive. N. meningitidis - Adjacent sides are flattened. N. gonorrhoeae - Adjacent sides concave and they are kidney shaped. Draw em to remember em! How do you remember the constituents of Mueller Hinton agar? Antibiotics used in Thayer Martin agar? Meningococci acidify Maltose (and glucose). Question: Which media are preferred for the acute versus chronic gonorrhea? In acute gonorrhea, cultures are easily obtained on Chocolate agar or Meuller Hinton agar! In chronic cases, it is better to use a selective medium such as Thayer Martin. The Rh blood group system is the second most important blood group system out of the 30 human blood group system after the ABO blood groups. Karl Landsteiner and Alexender Wiener used the Rbc's of the Rhesus macaque monkey to be injected into a rabbit. The serum from the rabbit agglutinated 85% of different human Rbc's (because of the formation of anti-D agglutinin in the rabbit). This led to the discovery of the Rh factor. 2. In the ABO blood group system..the antibodies A and B are of the IgM type. But in the Rh blood group system..the anti-D agglutinin is of the IgG type. So the anti-D agglutinins..
3. it appears in the plasma 2 to 3 months after exposure to the D antigen. 3 The basic importance of this blood group is when an Rh negative mother concieves an Rh positive baby. 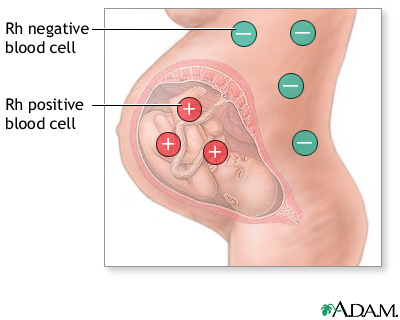 Anti-D agglutinin are formed in the mother's blood due to prior sensitization..either by Rh positive blood transfusion or due to mixing of blood during the birth of a previous Rh positive baby. These antibodies cross the placenta and destroy the baby's red blood cells, a disease called erythroblastosis fetalis..symptoms are severe anaemia, jaundice, kernicterus, hepato and splenomegaly and eventual death. Also to meet the excess Rbc's demands..the bone marrow produces excess of Rbc's..these are immature blast forms which are nucleated. Hence, the name erythroblastosis fetalis. The cure for this is to replace the Rh positive blood of the baby with Rh negative blood during the first few weeks of life( until the anti-D agglutinins from the mothers curculation are destroyed). To prevent this disease..administer the mother with anti-D antibody during preganancy or after birth of the baby, which binds to the anti-D agglutinins. The man with the golden arm. James Harrison was born in 1936. At the age of 13, he underwent a major chest surgery to extract a lung with metastasised pneumonia, and required 13 litres of blood. After surgery, he was in the hospital for three months. Realising the blood had saved his life, he made a pledge to start donating blood as soon as he turned eighteen. Since his first donation in 1954, he has donated more than 1000 times. 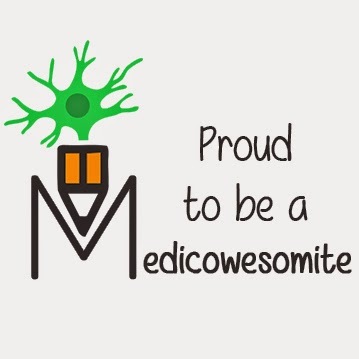 After the first few donations, it was discovered that his blood contained an antibody that prevents infants who receive his blood from dying of erythroblastosis fetalis. This blood is given to one in ten women whose blood is not compatible with that of their children.The uniqueness of his blood also created the Anti-D antibody vaccine. 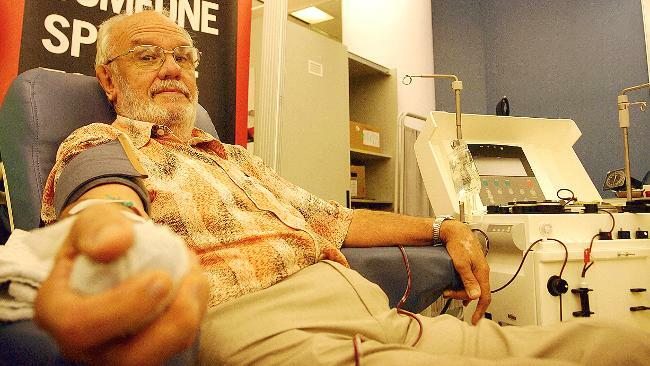 When he originally began donating blood, his life was insured for one million dollars. He reached his 1000th donation in May 2011. His blood has helped to save over 2.4 million babies with hundreds of thousands of women being treated with his antibodies. 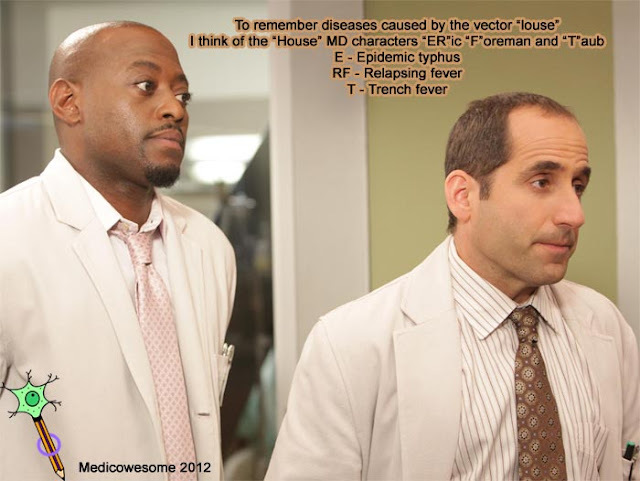 To remember the diseases caused by the vector mite, the mnemonic is "Mrs"
To remember the diseases caused by the vector flea, the mnemonic is "Feb"
To remember the diseases caused by the vector louse, the mnemonic is..
For the vector Tick; random images of ticks, lime, question marks, mountains, India, forests flow through my mind and I get my answer..
That should cover most of the tough part for now..
2013 is gonna be awesome.